Will the market-based approach to controlling air pollution prove more effective than enforcement methods used by pollution control boards? After failing to check air pollution through the usual enforcement methods, the Union Ministry of Environment and Forests (MoEF) has introduced a market-based mechanism to reduce air pollution. It is called the Emissions Trading Scheme (ETS). The ministry has initiated a pilot ETS in industrial areas of three states—Gujarat, Maharashtra and Tamil Nadu—with the aim of improving overall ambient air quality. These states were chosen because they have maximum number of industries and critically polluted areas. The scheme allows the regulators—Central and state pollution control boards—to set a cap on the aggregate level of pollution permitted in an industrial area, and then allows the industries to self-regulate to ensure that pollution does not exceed this cap. Industries that emit excess pollutants can buy points from industries that overachieve targets just like in the carbon trading system. “The Emissions Trading Scheme proposed by MoEF for particulate matter would be the first of its kind in the world,” says D Saha, senior scientist at the air laboratory of the Central Pollution Control Board (CPCB). “The scheme is in its nascent stage and the results of pilot study would be used to determine its feasibility in other parts of the country” he adds. The scheme comes at a time when compliance with the National Ambient Air Quality Standards (NAAQS) that came into force in 2009 has proved to be abysmal across the country. The mean ambient concentration of particulates in India is much higher than the prescribed norms and is about five times that of the United States. India’s national average of 206.7µg/m3 of suspended particulate matter (SPM) in 2007 was well above the previous NAAQS norm of 140µg/m3 (for residential areas). Most Indian cities exceed the current NAAQS norm of 60µg/m3 for respirable suspended particulate matter (RSPM). Average annual concentration of RSPM in the national capital is about 120 µg/m3, as against 60 µg/m3 prescribed by NAAQS and the WHO guidelines of 20 µg/m3. What's more, five of the six cities covered in a recent report of CPCB (2011) exceeded the standard in all the years from 2000 to 2006. Keeping this in mind the regulatory bodies are targeting particulate matter emissions under ETS. The scheme allows the regulator to set an overall emission level for a sector and allocate these emissions among units in the form of permits. At the end of each permit period, regulators can check emissions against permit holdings to verify compliance. Anant Sudarshan, senior research manager with J-PAL, which is working and advising the ministry on ETS, says the scheme is much more than a trading scheme. J-PAL is a network of affiliated professors working on poverty alleviation with their headquarters in the economics department of Massachusetts Institute of Technology (MIT). Sudarshan describes the pilot project as a two-part exercise. 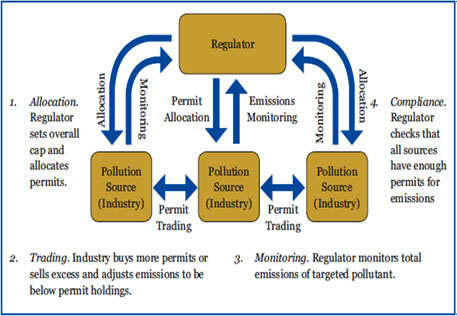 “The first part involves the testing of continuous emissions monitoring systems or CEMS (see 'Role of continuous emissions monitoring system'), which would provide real time data on industrial pollution to regulators; part two proposes using the data generated as the basis for a market-based regulatory programme,” says Sudarshan. When asked about the mechanism for setting the cap on emissions levels, Sudarshan replies that there are methods for this. One simple method for a pilot project would be to collect baseline data, compute the existing level of emissions and then set the cap at some percentage below that. Baseline emission levels can be most accurately estimated using CEMS and this is one reason why ETS is contingent on a successful completion of CEMS trial, he adds. Sudarshan further explains that the percentage reduction to be achieved is as yet undecided, but that the field data being collected on industry will definitely be helpful in determining the desirable level of reduction (higher the pollution would mean greater percentage of reduction) along with other sources of emissions that affect ambient air quality. The most economically efficient and fair way of allocating permits would be through auction. This will also help to determine the optimum price for emissions reduced before the start of any trading. As with everything else, this is the suggested design at this point from the research team, but not a final decision since the actual auction is at least a year away, says Sudarshan. Emissions trading would encourage compliance and push industries to pursue cost effective reduction strategies besides providing incentives to develop means by which emissions can be reduced, claim the consultants. “ETS will bring emissions below the prescribed norms. The system however demands efforts from both the regulatory bodies in terms of setting standards and industries in terms of compliance to the set standards,” says Saha. The system is a shift from the traditional command-and-control approach used in the country to reduce pollution, he adds. Officials with MoEF say that the modalities of the scheme are still being sorted out. These include determining the charge of permits, how it will be calculated and the provisions for penalty if any industry emits more than the prescribed permit. 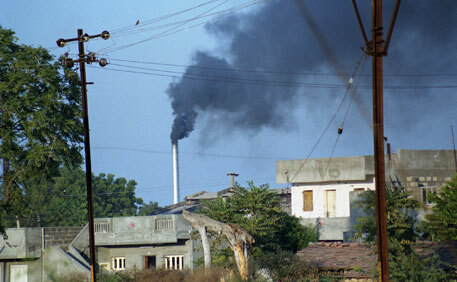 Saha adds that there is no law in the country which allows regulators to charge the industries for emissions. But state pollution control boards can discipline polluters by revoking the consents for them to operate. Another question that ETS raises is how the cap will be fixed for a particular industrial cluster. NAAQS of 2009 stipulates permissible limits for different emissions and has been the criteria for determining pollution till date. “The NAAQS would play some role in determining the cap. However, the process of determining such caps on a large scale involves many questions. ETS requires fair monitoring of total emissions which is acceptable to regulators, participating industries and public. The continuous emissions monitoring system (CEMS) ensures effective measurement, recording and standardised reporting of specified air emissions and other parameters. CEMS is thus the most instrumental tool for implementing ETS. Installation of CEMS, however, might be expensive for industries, but monitoring is accurate for a range of pollutants. It can also be used in a number of industries such as power, steel, cement, chemical fertilisers and petrochemicals, pharmaceuticals, boilers and incinerators and paper. One issue that needs to be taken care of before implementing CEMS is a common guideline with specification for calibration for CEMS type and results of different types of imported equipments to check for disparities and ensuring uniformity in results. Therefore, the Tamil Nadu Pollution Control Board has started an initiative to develop and standardise a basic platform so that there are no discrepancies in the results. One complication in linking NAAQS and ambient air quality to the cap is that the former refers to the total level of pollutants in an area, which is a function of all local sources (of which industry is a fraction and transport and others play a significant role) as well as more distant sources whose pollutants are transmitted through meteorological forces,” says Sudarshan. A simpler method for the pilot might, therefore, be to rely on estimating how much industries covered by the pilot are currently contributing and then setting a target below that,” he adds. Anumita Roy Chowdhary of Delhi-based non-profit, Centre for Science and Environment, says particulate matter (PM) is a diffused parameter with a very complex profile. ETS for particulate matter would involve number of uncertainties and requires a lot of objectivity in its approach. Introducing cap and trade for particulate emissions would need a lot of source profiling, direct PM control measures and enormous sophisticated technologies for monitoring and reporting. According to her, ETS for PM can be made possible only with a stringent monitoring and reporting system at each stack level and if load-based standards are introduced in the industries. However, such infrastructural and technological changes would be feasible only for large-scale industries and will be difficult for smaller industries to implement, she rues. MoEF has chosen Gujarat, Maharashtra and Tamil Nadu for launching the pilot scheme for enforcing caps on particulate matter because these states contain critically polluted areas with a cluster of industries that would facilitate greater trading and would be suitable for the scheme. Availability of accurate real time data is one of the pre-requisites of the Emissions Trading System. So, some industries in Tamil Nadu and Gujarat have installed CEMS to measure and report the total emissions from industry stacks throughout the year to provide reliable and continuous data required by ETS. The Tamil Nadu Pollution Control Board (TNPCB) is the first board in the country to set up a continuous emission monitoring station called the CARE Air Centre. TNPCB has already started collecting and collating real time emission data from as many as 47 industries and has the system in place to support trading. ETS, also referred to as PAT (perform, achieve and trade) scheme, is being tested in several industrial belts (see 'Participant clusters'). Gujarat has begun a survey of industries, their air pollution levels and their machinery in about 400 units in Sachin Industrial Cluster, Ahmedabad, Surat and Narol to implement ETS. Whether a trading scheme will prove to be more effective than enforcement of pollution standards by state pollution control boards is something that remains to be seen. The actual trading will kick off once pilot study is completed; it will be based on the results of pilot study. The pilot study is supposed to complete this year. The trading in emissions is expected to start in 2013-2014.